This chromolithograph is taken from plate 7 of William Simpson's 'India: Ancient and Modern'. The Parang Pass is the traditional trade route between the peoples of Spiti, Ladakh and Tibet. It connects the Lahaul-Spiti region of Himachal Pradesh with Ladakh. The Para Chu river rises to the north of the pass and turns eastwards to enter Tibet. This pass crosses one of the highest points in the Himalayas (at 18,300 feet above sea level) and is open only for a limited time each year. 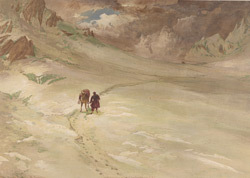 The artist William Simpson crossed it in June and nearly fell through a crevasse.